That is how cold it was this morning on the drive in to work. Brrr!!!! By the way… the car currently has no heat. Did I mention Brrrr!!!! It is most definitely full on fall here in New York. With the past few crazy months, I am really looking forward to some happenings coming up. I have two workshops coming up during the Genesee Country Village & Museum’s Domestic Skills Symposium, November 10th, 11th, and 12th. If you haven’t already, I highly recommend registering for this symposium. I’ve been cutting the materials for my new Exploring the Work-box: Tools and Trims. This is the workshop held on Friday. Next, I have to make sure I have all the samples organized and pretty. Attendees will be making their own sample book filled with trim samples made with the antique pinking tools I am bringing. I hope this will be the first in a series of “Explore the Work-box” workshops. Btw, I think I will be naming the pinking machines. The materials for the Sunday’s Pin Cushion Sampler are almost ready. Well, they have to all be put in one box to make their way to the village. We will be making popular pin cushions of the nineteenth century – strawberries, seashells, walnuts, and acorns. The weekend following is GCV’s Preparing for the Holiday’s event. This is a great opportunity to see the historic village in the fall as it will be packed full of interpreters planning for the coming holidays and getting ready for winter. Last year, I made strawberry pin cushions by candlelight with a fellow interpreter. The visitors were wonderful, with the best questions. I have yet to decide if I will be making strawberries or walnuts this year. To Net, or Not to Net: Revisited. A deeper look at the hairnet, how they wore it, and how to capture the correct look. This booklet expands on the article I wrote about hairnets a decade ago. This updated and expanded research will include extensive photographs and a new details. Lunch? Yes, I still want to do the off-season local history lunches. I’ve fallen behind on planning those, as with so many other thing. The winter hoods I am making this fall to winter season are based on original garments in my collection. For those in an area with windy, blustery winters, this first hood is a great option. 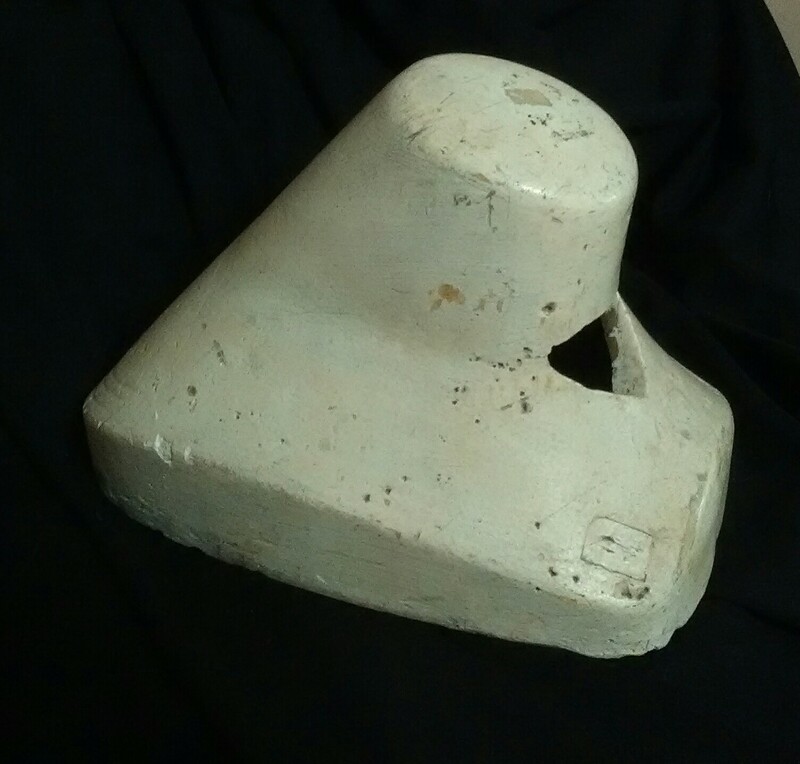 The original comes forward of the face with long lappet like cheektabs. It was made with a dark green wool exterior and bright pink inside. I will be offering this hood in both wool as the original and in silk as many similar originals are made, including another with the same shape and color combination. This hood is also available adps a pattern in my Etsy shop. This next hood is a sweet hood formerly in Vivian Murphy’s collection. I am quite lucky to be able to care for several hoods previously in her collection. This sweet hood has a light green wool exterior and gold silk interior. The shapes used to make it are beautiful. This hood also can fold forward to protect the face from the elements. I will be offering this hood in wool and in silk with various trims in period techniques. Functional and popular is this, a warmer, thicker batted bonnet style. This brim is shallower and oh-so soft to wear. The quilted bavolet protects the neck from the cold and snow. I will be primarily offering this style in silk with local wool batting inside. Dont worry, I haven’t forgotten the well loved wadded, or pumpkin bonnet. This thickly wadded silk bonnet is filled with wool. It is so and warm, protecting the wearer from the coldest of winters. I will be offering a few of these this winter in silk. Please visit my Etsy shop to see what is available. I expect to offer a bonnet every other week or so. I have some beautiful silks to work with and some really lovely wools. If I was to give this event one word, it would be “relief”. This time last year I was in horrible pain, with the worst sun reaction and migraine i can recall, to the point where I was literally hitting my head against the wall and packing my head in ice packs. I was quite certain I might have to be done with historical events. The thought was horribly depressing. I spent the whole year with the fear that I might have a repeat physical event. As I stood at the mirror this morning, doing my hair, I almost cried. It was Sunday. I was good. I ended Saturday feeling great. I was good. I didnt even need to resort to my backup , can lace lighter dress. (Actually, I found I laced closed! Alterations coming.) I hoped into the sewing room and pulled out one of my favorite dresses, from a fabric a far away friend gave me. I was good. So, here I am. Proof I made it to Sunday. My little sister, Lily, helped out in the millinery the whole weekend. She talked with visitors while I was away at the gallery and while I was consulting on millinery questions. She did a very nice job. She also followed the small ice cream handed child around the room guarding the pieces. Our most unique visitors were either the well loved plush bunny or the real live rooster. All guests during the battle must be watered. Roosters included. While I wasn’t sure which project to bring, I ended up being busy wirh sewing the whole of Saturday and I to Sunday . I actually got to talk about the dynamics of women’s employment. Sunday, two young men had an excellent vignette on my porch. They were gambling, for stamps. As they played, they pulled visitors in. I know some expected me to shoo them off. But, it was such and excellent interaction , I just listened from inside. I never once got to do the story I developed behind my unfinished sign. But, I did determine i must have one. I got to see the most amazing original fichu and a lovely net needlework. I was gifted some wonderful surprises. I am grateful and blessed by each. Thank you. 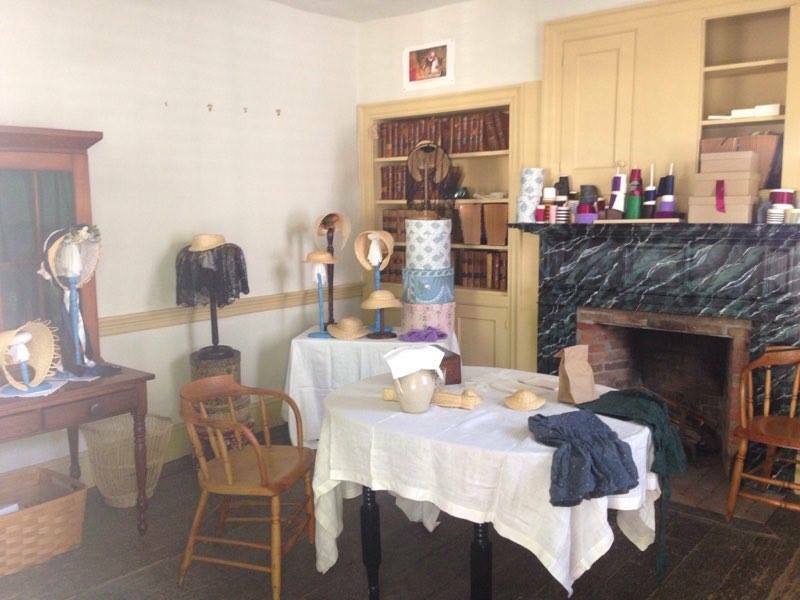 In a short hour or so, the Milliner Shop was set up, all ready for the Genesee Country Village’s Civil War event. A big thank you to Anneliese and Lily for their assistance. In all the preparation for transforming an Insurance Office into a Millinery – bonnet stands , band boxes, appropriate paint, appropriate papers, ribbons, bonnets, hats, veils – somehow I did not think about sitting down …. in a cage… in these three lovely, matching chairs. Ooops. Slight problem, especially since each of my chairs were home awaiting their much needed tlc. Luckily, I got the okay to borrow two chairs from Hosmer’s . This even gave us a chance to color check the paint colors. The hat stands are a shade lighter than the chair. Peter tells me Prussian blue had a range of shades, depending on how much white was added. So, mine just has more white. Here are the three fashionable bonnets on display. Each is one one of the new stands. The one one the left is the batwing soft crown with the blue and plaid silk. The one on the right is my personal bonnet, a soft crown with sheer check organza. Below is a bonnet with a decorative brim using antique straw threads. In the basket below are my slippers and a box of fabric scraps that would make some cute doll clothes or such. I plan not to bring that box back home. In the corner, is a little table filled with assorted bonnets and hats. As we were setting up, I started to think I should have brought my second table and more stands. The top most, on the boxes is a cottage bonnet draped in my newest veil, one I made with silk net and lace. (Coming soon, I will have a post comparing the light control of different veils.) In the center is a coarse straw bonnet that would be worn by a poorer or institutionalized woman. On the left is my example of a woven straw bonnet, by Vivian ! Murphy. The two hats on the stands are children size. The one resting on the table is a large crown fashion bonnet. The top box is the one I made, sewing a heavy pasteboard. The other two are recovered. I am tickled that the ribbons filled this mantle. I think it looks pretty”in use” rather than just display. Lily did a nice job. Can you tell which rolls are real and which are fake? I forgot to get a photo of the sign. As the lettering was a fail, and despite sanding off the black paint, the tracing depressions show through the new ground coats, it looks very much like the “work in progress” it is. I’ve decided to say the young man who was painting it for me took off to enlist as the trips came near. But, as we expect this fighting to be over by the end of the summer, he can finish it soon enough. 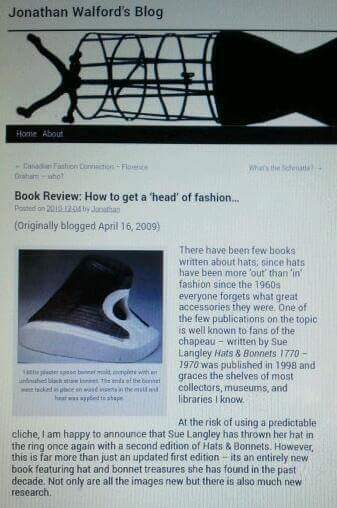 How To Make a Bonnet and Cap. Drawn Bonnets.—Have a plain willow shape ready, the size and pattern you wish your bonnet to be; measure round the edge, and put a pencil mark to denote half of the bonnet; measure your silk, or whatever material you are going to make your bonnet out of, on the edge of the shape, and let it be five inches longer to allow for fullness. This quantity is quite sufficient. Measure your material selvage way, regulate the edge of the bonnet very nicely; the fullness must be even, the same as putting on a shirt collar, and neat stitches are required. In drawn bonnet-making, do not cut your sewing silk; wind it, and have your needlefuls the length of the silk or material you are going to run; do not fasten off your silk at the end of the runner, as it requires drawing up before the bonnet is finished; halve the material of your bonnet, before you begin to run with white cotton, all the way down; when you have done the tucks in your bonnet material, place the silk, or anything else you may be making in a bonnet of, on the willow shape, and cut a small piece out at the ears to shape it like the willow shapes; never mind fastening off your ends of silk—they will be all right before you finish your bonnet. The tucks in the silk are to be run just as you would a petticoat or a child’s frock. Four or five are enough. When your bonnet is run, and ready to put on the shape, it ought to measure seven or eight inches deep, according to the wearer. Old persons generally require a larger bonnet than young people. Try you hand in making a bonnet in a piece of book muslin or something common at first. The size of the tucks varies according to the taste of fashion a little. They are now worn all sizes. Some bonnets have only three tucks with wires in them, others five. Before you get forward in your running, try the wire you are going to use, “and do not do what is too often done” – run the tucks, and then find the wire will not do. The wire had always better be too small than too large; in fact, the runners must be loose on your wire. The cane or whalebone for drawn bonnets I have never seen used. A wire, covered with cotton, is to be bought any size you wish. The wire must be very hard and firm for the edge, and soft and pliable for all the rest of your bonnet. Attend to this, or you will make people’s heads ache. I would not give two pence for the prettiest bonnet ever turned out if the wires were not light and soft. All these things only require attention; for little things I have no doubt some of my young readers think them in comparison to the look of a bonnet. Many persons can tell you what part of town a bonnet has been made in simply by the foundation—I mean the wires and supports of the bonnet. If you wish to make a drawn bonnet of two colors or two pieces join them together before you begin; and now be careful, joining the work strong; and let the tuck you put in hid where it is joined, not because you wish anyone to think it not joined, but for neatness. When you have run the tucks in your bonnet, before you begin to put in your wires, cut the piece of silk that at the ends the exact shape of your pattern-frame; this after the wires are to be put in; and now place the silk on half of the willow shape;tack the silk, not the wire is in, on the shape, all around the edge of the bonnet; now pull your wires to the right size, that is, exactly like the shape; having done this, now fasten the short wires that come down at the ears to the pieces of chip and wire that you have run through the edge of the bonnet. When the wire that goes in the edge of your bonnet must go quite round the back, and cross a little. It is almost the whole support of your bonnet. When the wires are all firmly fastened, you may now draw up your sewing-silk that is in the tucks. Be careful not to break them. You will find our bonnet looking better for being run well, and then drawn tight. All this must be done before you take your drawn bonnet off the willow frame. You will require five supports got ready to put in. They must be silk wire, rather firm, and the color of your bonnet. They should be cut one inch longer than the bonnet, so as to allow a small piece to be turned down, top and bottom. Put one piece in the middle of your bonnet, and the remaining four at equal distances. These wires are called support’s, as they help to keep the bonnet in shape. Having reached so far with your bonnet, bind all round the back from ear to ear, and bow put on our curtain. In putting on your curtain, draw the thread at the top to the size of ten inches, and make this firm; place half your curtain to the half of the back of your bonnet; now sew it on; mid the fullness is equal. If you wish to make a drawn bonnet with puffs, begin the bonnet just in the same way. When you have made a runner or tuck, push up a little of your silk; a very little will do. You require a piece of net underneath your silk. This net must be the size of the piece of the silk. When you turn down the first hem, put the net inside, and run it with the silk. The use of this piece of net is that you may full your silk on it, keeping the net plain. These kind of bonnets require a lining; it should be a little full. Always bear in mind that two or three inches are a good deal of fullness in millinery, in silk, net , or anything else. When you put linings in any bonnet, puff net on the lining before you put it on the bonnet. If you put more than one inch inside your bonnet, put it on the lining before you put the lining in. The bonnet is lined after the outside is done so as to keep it as fresh as possible.